OK, winner was Sal Towse, who entered over on Facebook. Thanks for entering, I will try and get another contest up today. These look very interesting. Thanks! I love your site! This is great. It is strange what people will leave behind in a book. Thanks for the great contests! I hope I get them, I love books. The Fitzgerald and Hemingways are calling me. I feel compelled to point out that my cats are named Gatsby and Hemingway. Very cool! Love all the contests you've had. 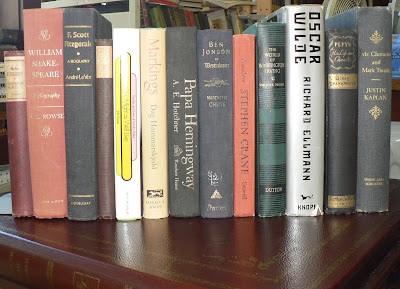 I'd love these for my father - he's a biography junkie! Thanks for offering these. I'd love these for my father who is a biography junkie. Thanks for offering these! Wow, these are fascinating! I love author biographies. Awesome contest! Thanks again for these generous giveaways! Fun contest. I like biographies. Awesome site, always cool to see what you find in books. I'm not able to look to my favorite blogs and facebook friends as I would like, but enjoy when I can.